The dichotomy may lie in the type of writer each category draws. How-to writers predominately dwell on the acquisition of a skill set: fly tying, for example, can include anecdotes about where a fly is best used, or the genius of the hand behind an original fly, but usually the writing forms tight bands of knowledge around a skill with prose that may be interesting, but pedantic. On the other hand, dream-on books are more a subset of adventure travel writing, a pastime honed by the Brits on their wide-ranging, sun-never-sets, escapades. I’m thinking here specifically of Chris Santella’s “Fifty Places to Fly Fish Before You Die,” the modern-day, bucket list approach to adventure travel writing. Many “dream-on” books stand the test of time precisely because that snapshot of an adventure has been so vividly captured and eloquently composed. I’m thinking of Charles McDermand’s “Waters of the Golden Trout Wilderness,” and of Ray Bergman’s “Trout,” both of which leave readers dreaming not of the future possibilities, but of worlds that have been lost. The last book I remember to combine the qualities of making us better fly fishers, as well as stoking our desire to get out and do it is Sheridan Anderson’s “Curtis Creek Manifesto,” a marvel with the subtitle, “A Fully Illustrated Guide to the Strategy, Finesse, Tactics and Paraphernalia of Fly Fishing.” I would wager that Anderson captured many a novice’s imagination as he envisioned exactly where to perform that initial “Curtis Creek sneak.” I still vividly remember getting down on my hands and knees on the catch-and-release section of the Owens outside Bishop, Calif., savoring that, possibly, using my newly acquired stealth, no trout would spot my otherwise hulking frame. In essence, books that combine both qualities are rare and possess the kind of magic publishers seek while devouring manuscripts in the hopes of finding what will keep a book in print to become a “perennial.” Case in point, the manifesto was originally published in May, 1978. It’s been 16 years since the classic “Carp on the Fly” broke very new ground by advocating catching what was then widely considered a garbage fish. While trying to figure out exactly what was going on with carp on the Los Angeles River, I turned to it over and over again. You can find with a little searching on this blog, its table on water temperatures and carp. That seminal book by Barry Reynolds, Brad Befus and John Berryman begins with the sentence, “Yes, this really is a book about fly fishing for carp,” and goes on to cover everything about the fish from habitat, to stalking, to proper fly presentation. I’m careful with words like “classic,” but this definitely is one, with a homespun feel aided by black-and-white photographs. The cover always struck me as odd, a whimsical line drawing that shows a carp contemplating a tasty crayfish. Instead of predator and prey, the two seem about to begin a conversation. The cover shot for Deeter’s book shows a freshly released bruiser-of-a-carp in shallow, clear water. There’s no ambiguity in this shot. Any fisherman would want a piece of this fish. And the art throughout the book will draw readers to dreaming, whether of the flats of Lake Michigan or even of the Los Angeles River. I did yearn for more information in the captions. Illustrator Mary Kelley penned useful, even inventive graphics to help readers understand this elusive prey. In one, “Grading the Presentation Zone,” she uses grades from A to F around a carp’s head and upper body to represent the strike zone. It’s his breezy style that pulls all the elements together and lifts this book from the ho-hum to something much more. By the end of the book, readers know a reasonable amount about this wary adversary, its traits, behavior, and the best ways to catch him. My question to myself right now: how can I possibly be writing this glowing review about a book that has a corporate logo plastered on its cover? 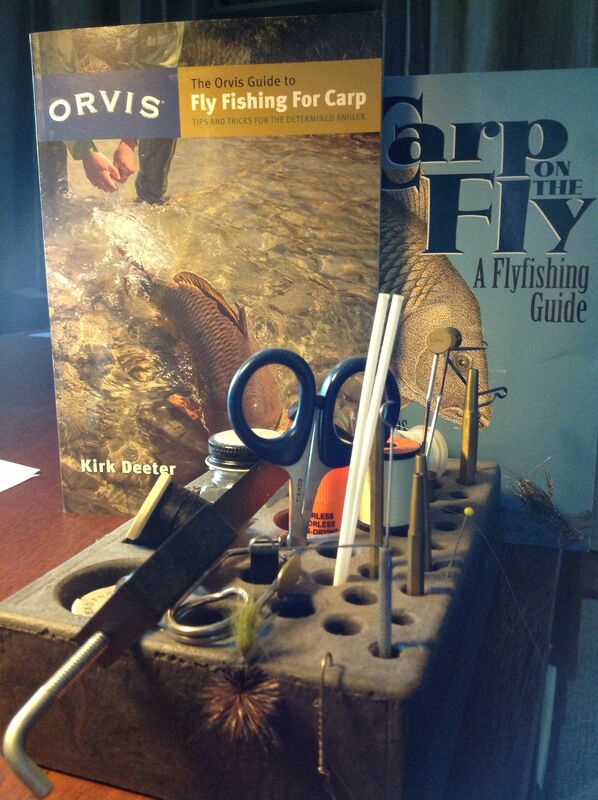 While Deeter deftly makes his generic recommendations based on rod length and weight, the photographs tell the tale of an Orvis purchase. Ditto nets, waders, wading shoes and fishing pliers. Still, because of the thorough research, enviable and obvious time on the water, gripping prose and spot-on photography, readers probably won’t wince when it comes to product placement. Oh, and the Curtis Creek sneak? Peruse the pages and you’ll find it, along with a thorough education from this decade’s most useful book on a growing obsession. Well said Jim! I read mine quickly and enjoyed his plain spoken analysis of carp fly fishing greatly. Orvis not so covert endorsement~wish more were out of the closet. Sheridan’s book a genious form of teaching.